We are pleased to announce the release of our debut album Diaspora : Explorations in Tele-Improvisation through the Chilean net label Peublo Nuevo released 16.12.14. 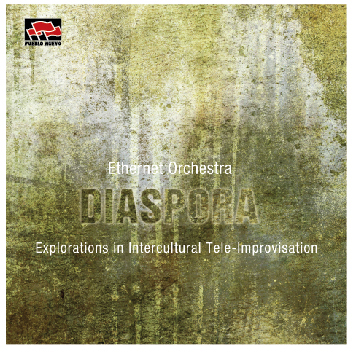 Diaspora is a compilation of live freely improvised performances by Ethernet Orchestra recorded between 2009-2014. It features musicians from a diverse range of cultures and musical traditions performing simultaneously between Iran and Australia via North America, Brazil and Europe. The ensemble combines an array of instruments including Mongolian horse fiddle & throat singing, tabla, Persian tanbur & tar blended with Buchla synthesizer, guitar, trumpet, sax and Max/MSP processing.The majority of the recordings are from performances with live, online, and co-located audiences. Many of these performances also included visual artists Helen Varley Jamieson, Neil Jenkins, Graziano Milano and Michael Szpakowski mixing live visual collages in the networked audiovisual platform VisitorsStudio. These mixes can be viewed from the menu above. Performing musicians include; Mark Francombe (NO) – guitar Bukhchuluun Ganburged (MN) – morin khuur & throat singing Richard Lainhart (US) – buchla 200e, haken continuum & guitar Roger Mills (AU) – processed trumpets Hervé Perez (FR/UK)- soprano saxophone & electronics Shaun Premnath (MY/ AU) – tabla Peyman Sayyadi (IR, CA)– tanbur, Martin Slawig (DE) – processed percussion & electronics Aref Toloei (IR)– tar Yavuz Uydu (TR/AU) – oud, bendir Elke Utermöhlen (DE) – processed voice & electronics. During this period we also had the great fortune to collaborate with the late Richard Lainhart, who is featured on many of the recorded improvisations. Ethernet Orchestra would like to dedicate this album to Richard whose passion and generosity lives on in these recordings. Thanks also to Richards wife, Caroline Meyers for the sleeve design.